Right now, it is just a rebrand, but I am working on newer features and I do accept contributors. This is a pretty neat project good luck with it :-) I'll definitely be using it now. Page content is more fluid and it scrolls better. Can move up and down the page faster with less jerkiness and or slow motion. I commend you for your efforts on RetroZilla. I'm sure people will like it. I have been playing with the default install for the last few hours. I love it, I'm officially ditching Opera. This is lightweight, fast and doesn't require anything. Just install and go. Youtube works flawlessly. No stuttering, no nags talking about update browser etc... 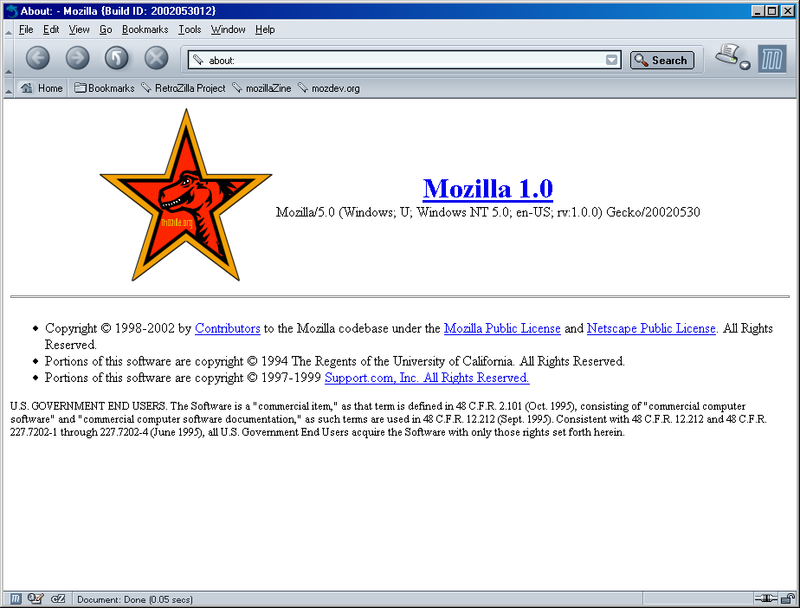 This is my new default browser for the moment. I will play with the features over the weekend. Testing my email with the built-in and other things. Thank you so much for helping make my new year. I will report back. It plays very well with my hybrid system. No errors so far. Keep at it. I especially like the idea that the profile is now located within the actual app folder. Otherwise when testing diff. versions of SeaMonkey you'd have to very careful that your regular profile is not changed that much that is 'unusable' afterwards. Installing the German language pack worked also great. But it is kinda weird to use a browser again that does not save opened tabs/sessions for the next use. Do you plan to port this feature ? And an add-on manager is also needed. If I delete that^ from a batch file every time will that clear out my cookies? This computer is shared with other people, and I don't want them logging into my accounts and whatnot. Just privacy in general. Don't want to get too off topic, but I'm using CCleaner 2.36.1233, is there a way I can just tell CCleaner where and what file to delete? Under "options" in CCleaner there's an "Include" button that allows me to allegedly delete cust files folder... will that work then If I point it at the cookie file for Retrozilla? Assuming that cookie.txt file in the Windows\App Data directory is the right one? I have found a couple of (M), also a small bug. When you select Pictures and Text options, you get no text, only pictures. I use the text only option. re: CCleaner - the answer is yes. I use it to clear out *all* UserProfile TEMP content as well as *all* Temporary Internet Files (IE folders used for Googling). Thanks, Submix8c. I will give it a go then. Regarding the language packs, I have no idea how long they will continue to function, I am working on a lot of UI enhancements for 2.0. The tab sessions feature I will have to look in to. I may have to write a new system entirely, as SeaMonkey's frontend went under a total rewrite between 1.1.19 and 2.0. 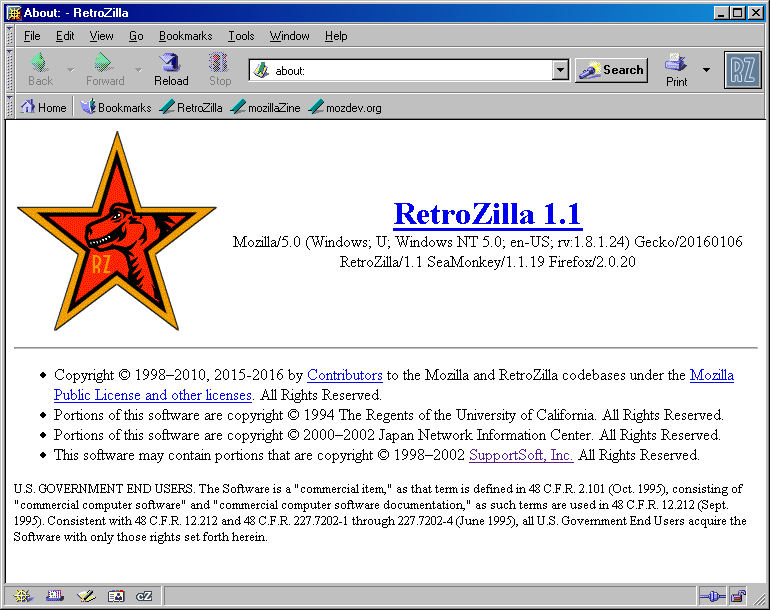 If an add-on exists for SM 1.x or Netscape/Mozilla and it's MPL'd, I will integrate it into RetroZilla. An add-on manager is one of my plans, if I can find an existing add-on for Mozilla/NS and it's MPL'd (same as above) I can integrate it into RetroZilla. I will try to fix the M's that I didn't find before. I will also look into the modern theme bug. To make it easier to reproduce, what OS are you running and in the case of 98/Me does it have KernelEx? I'm using Windows 98 SE with U98SESP3 + 98SE2ME, no KEX. It is the same with NS6 and the latest versions of SeaMonkey. One thing that can be done is enable the Classic theme (view => Apply Theme => Classic), but by doing this you lose the blue/gray theme and get a standard gray Windows interface. Thanks, I'll just have to deal with it. Not a big issue, I have learned to improvise. What about a fork version of Pale Moon? Did PM ever support Windows 9x?